Our boy's Very Hungry Caterpillar shorts or pants set. Straight from The Very Hungry Caterpillar by Eric Carle. A beloved children's story has come to life. A white shirt is paired with red stripe seersucker shorts or pants. 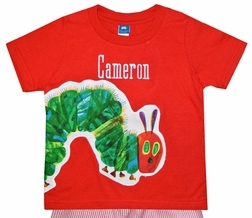 We hand applique a large fabric panel Hungry Caterpillar cutout from the Eric Carle fabric made by Andover on to the shirt. The Hungry Caterpillar is crawling from the back of the shirt to the front. He hasn't quite made it yet! Add a name monogram in red to personalize the outfit and if you are using it for a birthday celebration, complete the outfit with a matching birthday hat and bib!